Life Begins at Retirement... Celebrate with a Personalized Retirement Favor! This is a day that won't soon be forgotten. Why not give your guests a personalized bottle label, candy bar wrapper, or candy kiss sticker to celebrate the retiree's special day! 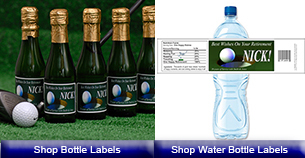 With our large selection of retirement designs, you can choose an existing design or let us custom design a wrapper or label for you at NO ADDITIONAL CHARGE. All of our products are FULLY Customizable - Colors, Fonts, Words, Pictures, Original Artwork, etc. Custom designs are our specialty and there is never an additional charge! The text on our retirement wrappers, labels, and kiss stickers are for example only. You are welcome to use the sample text or come up with your own! You can also choose your colors and add a photo of the retiree or company logo with number of years worked to commemorate the day. Make it personal. 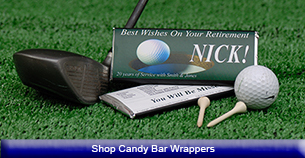 Our personalized retirement bottle labels and candy bar wrappers can be customized to fit any activity, hobby, or profession and will add a sweet touch to the retirement celebration! We are your #1 source for Personalized Bottle Labels, Candy Bar Wrappers, and Candy Kiss Stickers!